The town of Page in Arizona makes a great day trip from Zion National Park, Bryce Canyon, the Grand Canyon, or Sedona. 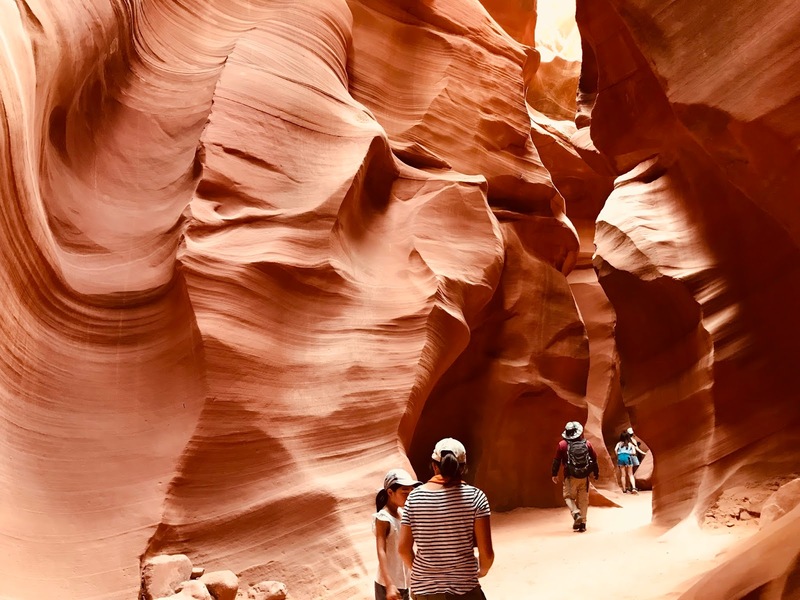 That's where you'll find Antelope Canyon, a sandstone slot canyon that needs to be seen to be believed. 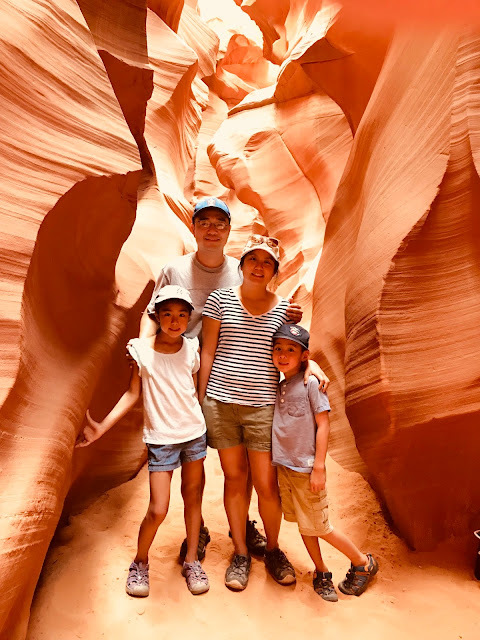 And just a few minutes from Antelope Canyon is Horseshoe Bend and Lake Powell, two other attractions that will make your day in Page. The main attraction in Page is Antelope Canyon (although it's technically in the Navajo Nation of LeChee). 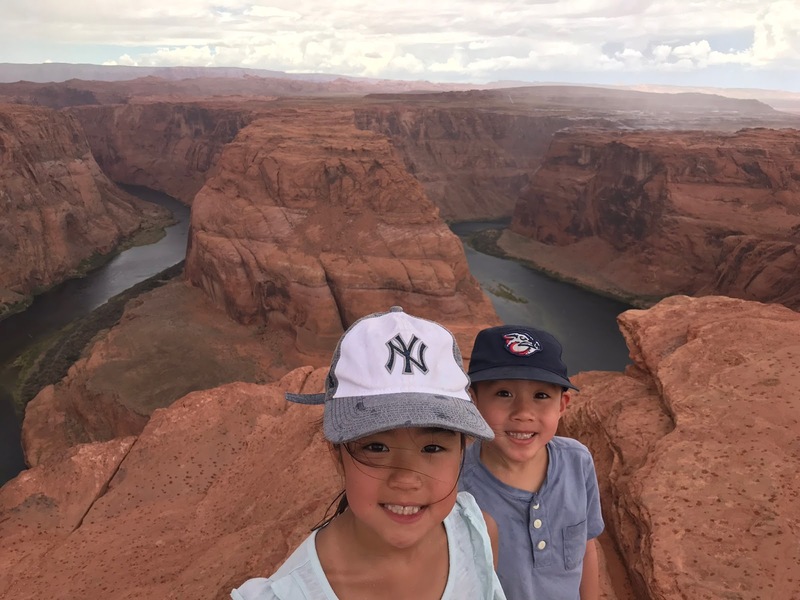 There's an upper canyon and lower canyon, and the lower canyon supposedly offers a better experience for kids, while the upper one is popular among photographers for the midday light. You can only access the canyon with a guide, and we booked a tour with Dixie Ellis, which turned out to be great. Before the tour started, we were treated to a traditional Navajo hoop dance. The whole thing lasted about five minutes, and it was a nice little taste of the local culture. Then all the people going on our timed tour were separated into smaller groups and assigned to various guides. We were lucky and got a great guide named Buddy all to ourselves. The hike to and through the lower canyon is a little more than a mile round trip, and takes about an hour to complete. It's a lot of fun for everyone, and the time goes by quickly. 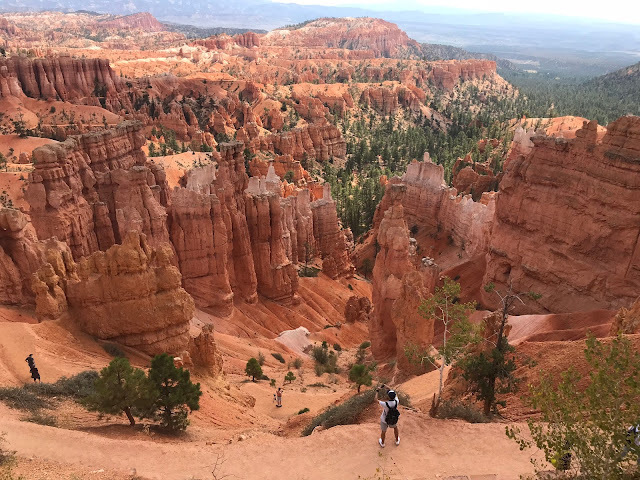 Your guide will lead you on a 10-minute walk across the red sand to the entrance of the canyon, where you'll descend a series of stairs, then start to twist and turn through the curvy and narrow canyon walls. Our guide was fantastic, pointing out fun shapes created by the curves of the canyon for the kids with his laser pointer, and taking photos for our family at all the prime spots. He knew all the right filters to use on my iPhone to capture the best colors. The hike involves climbing many stairs and ladders, so strollers are definitely out, but all the climbing structures are very sturdy and not at all difficult for kids to manage. In fact, the ladders were definitely a part of the fun of this hike. After traversing the whole canyon, you ascend one final set of ladders and then pop out of a hole in the ground like a gopher! If you're visiting in the summer, make sure you reserve your timed tour for the early morning, as it can get seriously hot in Page after 10am. Also keep an eye on the weather forecast for the area, since the tour company will cancel your tour if there's even a hint of rain. Flash flooding in the canyon is a real danger. As Buddy told us, it may be scary to see scorpions or spiders in the canyon, but the scariest sight of all is a rain cloud above you. Just a few miles from Antelope Canyon is Horseshoe Bend. You'll need to hike about three-quarters of a mile over a paved but sandy trail to reach the stunning lookout point. There are big signs at the beginning of the hike that tell you to bring enough water for each person, as the sun can be brutal in the middle of summer, and there's no shade. Fortunately for us, it was a cloudy day. After about 20 minutes, we finally reached the Horseshoe Bend lookout point. It's so expansive that it almost looks unreal. I snapped the photo above just as dark clouds rolled in over our heads and started pelting us with huge raindrops. The wind blasted sand on us the whole way back to our car, and we barely made it in before the sky opened up and started dumping out rain. Also in the area is beautiful Lake Powell, and our friends who were vacationing with us took a boat ride on the lake. There are also options to kayak and even rent a houseboat for a few days, which looks like loads of fun. We drove into Page for just a day, and stopped for lunch at traditional Mexican restaurant El Tapatio before heading back to Zion. Tacos, rice and beans, and a big helping of chips and guac make for just the right meal after a full morning of hiking! As I mentioned, Page is central to many bigger destinations in the area, including Zion National Park, Bryce Canyon National Park, the Grand Canyon and Sedona. In my opinion, there's no need to stay in town; it's best visited as part of a day trip from one of these larger locations. Here are my family-friendly itineraries for Zion and Bryce (pictured below), which are both absolutely amazing and so much fun for the kids.